Create your own magnetic notices and signs with our versatile A4 magnetic paper, supplied in packs of 10. Tags: Magnetic Paper, magnetic printing paper. Strong Magnetic Strips & Accessories, Magnetic Strips & Access., School & Library Document Display, Specialist Labels. Available in a choice of matt of gloss finish. 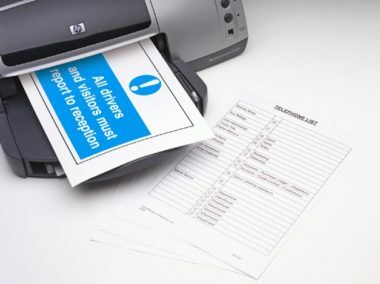 Print directly onto this special inkjet coated magnetic paper to produce your own magnetic notices, pictures or labels etc. Supplied in packs of 10 A4 sized sheets. These represent an economical and versatile method of printing. Once your item has been printed the sheets are easily cut/trimmed to the size or shape required.